What are the best RV BBQs? You can go RVing and not bring the best RV BBQ with you. Because it’s the only way to enjoy cooking with your friends and family, you must learn which product fits your needs best. Read this paragraph and see if something catches your attention. After meticulously reading various feedbacks given by previous customers and experts, along with the overall product quality, we’ve concluded that one great choice of RV barbecue is the Magma A10-603 Adventurer. Besides being made of durable stainless steel, the unit comes with a locking lid that ensures all components are safely stored during maneuvering and transportation. Plus, it is outfitted with a convenient side grease tray for easy access. If the Magma A10-603 Adventurer is not available, don’t forget to check the Flame King YSNHT400. The construction of this item is 100% stainless steel, which makes it durable and suitable for long-term use. It's designed for a standard 1-pound propane fuel canister, but it can be adapted to any low-pressure gas fuel system that you have on hand. Its locking lid secures all internal components and prepares them for storage or transportation. This item is not recommended for marine use but other than that, there have been no issues reported. The easy and convenient side access tray can be used to clean the grease off the item quickly. Its sturdy folding legs allow you to mount this product virtually anywhere. This RV or trailer compatible barbeque is delivered with a bracket that will allow you to mount it right onto the side of your vehicle. You’ll be able to cook a delicious meal anywhere you are. This complete grilling station is convenient, and it includes an adjustable flame controller, a 214-square inch grilling surface, and a deck. The upper grill shelf is fixed and can’t be moved, which according to some reviews is the only major drawback. It’s designed with locking retainer pins that secure the mounting bracket. Safer storage is allowed due to the dual locking lid that protects the inside components. Including mounting brackets for hanging on an RV or mounting rail and folding legs to adjust this item for tabletop use, this barbeque is a great fit for cooking a delicious meal outside. It’s quick to set up this product, and it offers 180 square inches of cooking surface and a Piezo electric spark starter that will last for 20,000 starts. Some users have stated that this barbeque gets hot really quickly, but apparently, it can be adjusted with a screwdriver. This product works by connecting the hose and valve included to a low-pressure propane tank. It has a safety shut-off valve that prevents accidents. Having the best BBQ for RV is quite useful especially if you like to go camping with your family or with a large group of friends. Given the number of products for sale available on the market, it can be a tad difficult to decide on a specific model. So we’ve gathered some information and made a list of features that matter most in terms of RV BBQunits. The first step you must do is decide on the type of bbq you want to invest in. Because each of these camping grills is outfitted with a unique set of advantages and disadvantages, it’s quite understandable why you need to determine how often you need to use the tool and for what purpose. One type of grill is the charcoal barbecue that is the most common choice found among RV enthusiasts. The reason why charcoal is the top choice is that they can be found in any supermarket or local store and they don’t cost much. The major drawback is that these tools need a thorough cleaning after each use which is definitely not easy when cooking several dishes and types of foods. Another option is propane grills that combine what charcoal units have best to offer along with the easy cleaning part. Therefore, it’s an excellent choice for the best RV camping grill. Aside from the great level of performance, this grill provides additional features that charcoal products don’t have, such as perfect heat distribution. The majority of RV BBQ reviews recommend paying attention to the construction materials because it has the ability to interfere with the cooking quality and process. Generally, you can opt for ceramic, stainless steel, aluminum or iron. Indeed, if you go with stainless steel, you’ll be more than pleased because it can be cleaned without too much effort and the exterior doesn’t get affected by rust. Most units come with only one temperature control setting. This is due to their small size. However, if you want to get a device that has dual burners, you can always opt for dual temperature controls that allow you to set two different temperature levels when doing the cooking. As far as the cooking surface, you need to get clear about how much area you actually need. If you need to cook an entire meal using the grate, you’ll definitely require more space than you might use for grilling just one burger. Grates are important, too. Because they are the ones responsible for conducting and holding the head, you must buy a camping grill that does its best in this department. For example, chrome and nickel are lightweight but don’t hold the heat so good, and they can easily break after some usage. Cast iron retains the heat, but without an oil treatment, it tends to rust. Stainless steel works great, and cleaning is a total bliss, even though they are a bit heavier than other types of grates. If you’re a grill enthusiast that likes to enjoy a delicious meal right in the middle of nature, you’ll be impressed by the quality of this product. 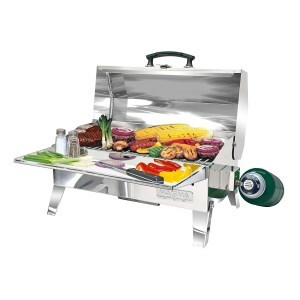 This camping grill is built entirely from stainless steel and is designed to use standard 1 pound propane gas canisters. The best part is that the unit can adapt to a low propane fuel pressure or a natural gas fuel system, depending on your possibilities. The grill boasts a large cooking surface as well as a balance locking lid that enables all internal components are safely stored while transportation. Also, this item features durable handles made of a special material that stays cool no matter the level of heat you’re using. Because the legs are foldable, they allow you to easily set up the grill wherever you want to camp. 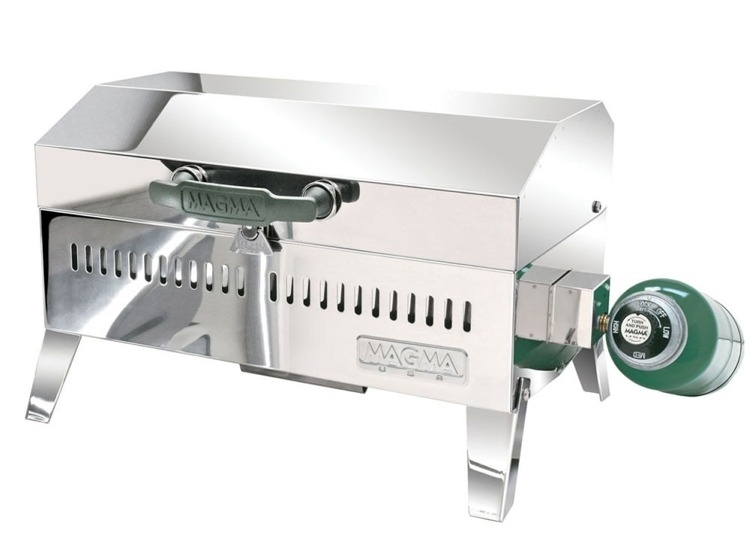 Aside from that, it has a convenient side access tray for the extra grease and a radiant plate assembly that ensures the heat is distributed evenly. Grilling has never been so easy, but with this tool, you get a complete kit that allows you to cook several dishes for you and your entire family. 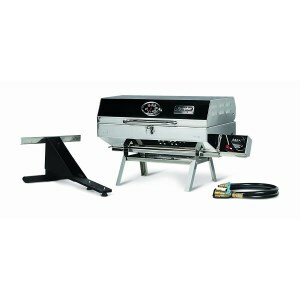 In addition to the grill unit itself, the product package provides a complete grilling stations with items such as an adjustable flame controller, an upper grill deck, and a large surface of 214 square inches. Aside from that, this camping grill is outfitted with its own bracket system that allows you to mount the device on any side of your RV. Also, the hanging rack can be used as legs if you want to ensure the grill stands freely, without extra help. There’s a dual locking lid that safely closes the grill for storage or transportation. There’s no need to worry about the installation process because the item comes with a detailed user manual. Make sure you connect the grill to the propane gas system of your RV. The grill has ergonomic handles placed on each side. 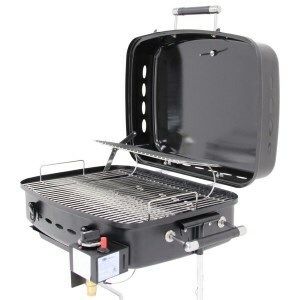 This portable gas grill is designed to be used for Rving or any type of outdoor activity. Made of durable stainless steel, the unit is incredibly lightweight and boasts a large cooking surface of 180 square inches. Besides the mounting bracket that allows you to hand the unit on the RV mounting rail, the product also comes with folding legs that come in handy if you want to use it for a tabletop position. You can rest assured that no safety issues will occur because the grill features a hose and a valve for quick connection and a shut-off valve that prevents any accidents such as non-ignition fuel discharges. The product is manufactured to use the RV’s low-pressure propane supply. Furthermore, the grill is outfitted with a cast iron smoker plate that enables the heat to be distributed on the entire cooking surface. Plus, it ensures the flavor of the food is kept without producing grease fires.